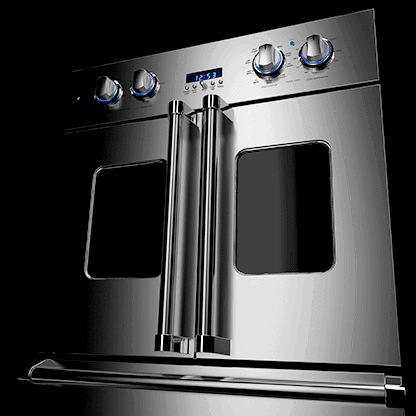 Where can you find the Viking appliance repair Albuquerque kitchens have trusted for years? Only with Ortega’s Appliance Service! Founded in 1975, the Ortega family has devoted their time, energy, and expertise to helping hundreds of families keep their kitchen and laundry appliances working at optimal levels. Our award-winning service, dedicated employees, and loyal customers have contributed to steady growth over the last forty years. In 2015, we moved into a larger headquarters and brought additional qualified service personnel onto the team. We’re now excited to continue our expansion by offering our service to the communities of Santa Fe. With the ability to service over forty brands of appliances, Ortega’s Appliance Service is your go-to for fast, friendly, and dependable Viking appliance repairs in Santa Fe & Albuquerque! Once reserved only for restaurant kitchens, Viking now brings fantastic commercial cooking technology and innovation right into your very own home. As a part of the largest commercial kitchen equipment manufacturer in the world, Viking’s appliances have you covered from cooking to cleanup. Featuring an array of indoor and outdoor cooking appliances, refrigeration units, ventilation systems, and culinary pieces, Viking’s products cater to your kitchen’s every need. Ortega’s Appliance Service conveniently offers factory approved service for Viking products. From freezers and ovens to warming drawers and dishwashers, Ortega’s expert technicians are ready to service any appliance. Founder Manuel Ortega, Sr. started this business with a mantra taught by his parents: “Always do the right thing.” Today, Manuel’s son Manny continues to operate the company with the same strong ethical focus. Ortega’s Appliance Service believes in honesty, loyalty, and transparent business practices. We quote our fixed rate prices straight from the National Major Appliance Flat Rate Labor Guide. Our 90-day and one-year warranties on parts and labor give you assurance that the job was completed correctly and confidently. The expert technician responding to your service call will even offer their opinion to purchase a new appliance if they believe that the machine is not worth the repair cost. Because of our commitment to doing right by our customers, Ortega’s was the first appliance repair service to be recognized with the New Mexico Ethics in Business award. We promise to keep your satisfaction as our top priority. For the Viking appliance repair Santa Fe & Albuquerque families have put their faith in for years, call Ortega’s Appliance Service.